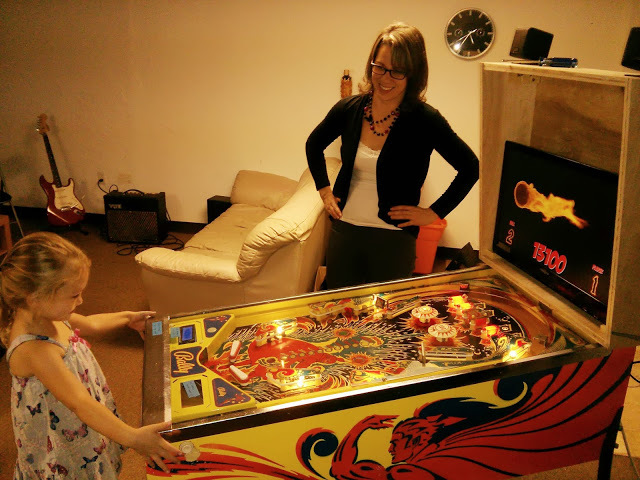 It all started when [Iancole] bought a Fireball Home edition playfield on some famous auction website for $135. Originally, he had the intent of lighting the lamps with an Arduino, framing it, and hanging it on the wall of his office — which often happens with old pinball parts. But then his boys asked if he “could make it play”. [Iancole] managed to find the pinball schematics online and started designing the electronics required by the many LEDs, solenoids and switches. As the LEDs and switches are on the same matrix, he chose a simple Arduino to cycle through them, giving the player the impression that the lights are constantly on. [Iancole] originally planned on using his raspberry Pi to control the solenoids, but he later switched to another Arduino because of the precise timing required. Therefore, his Pi was used as the heart of the machine. It is interfaced to the two Arduinos to read states and send commands while running the game program, displaying HD graphics on a 24″ screen, playing music and game event sounds. All the electronics are proudly displayed on the backbox, and many developments are planned for it. Also, the machine will be on display at the Orlando Mini Maker Faire on October 5th! Absolutely fantastic! Hope to see more updates on the progress of this project in the future here on HAD! Nicely done! Not that it makes a difference but the picture tells me you got the genders wrong. The article says that is his wife. That picture was taken at a FamiLAB event open to the public. We had Gordon Hollingowrth of the Raspberry Pi foundation stop by, and give a presentation, so it was a Raspberry Pi themed day. Neither of the people in the Hack-a-Day thumbnail are related to Ian. Also, Ian is infact a male. I thought ARM could run RTOS now. RTAI supports ARM so why can’t it run on a Raspberry Pi? Or is the latency just too bad with a Raspberry Pi? RasPI can run RTOS, i’ve tried RTEMS and it works. Ian is also using the Pi to render video, and make sound effects for the pinball machine. He’d lose the ability to do such things easily if he switched from a Linux distro to a RTOS..
RTAI is Linux RTOS kernel extensions. Well, guess you learn something new everyday. :) That being said, Ian is using a ton of IO ports, and is already using a huge portion of the Raspberry Pi’s resources as it is. Throwing another MCU at it doesn’t hurt.